The through - hole from corrosion on the bodywork of the car detracts from the appearance and bring a lot of trouble to the owner. 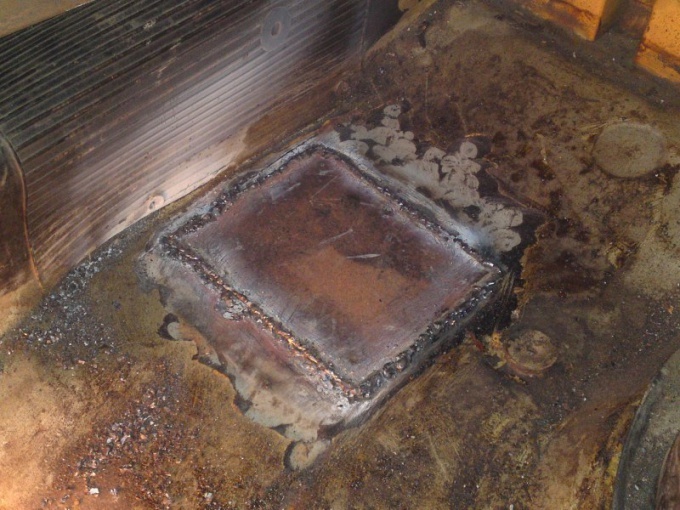 In order to close up these holes without welding, are used most often in two ways. One of them is simple and accessible execution, the other is the reliability and durability. Each patch impregnated two part epoxy glue and attach to the hole on the back side of the body. Before gluing each subsequent layer, wait for complete drying of the previous. After all the layers and thorough drying, the outer side swipe the cleaning and levelling of the surface, putty, priming and painting of the body. To use a different method of cut sheet metal patch larger than the hole on 20-30 mm. Pre-surface area around the defect will clean, treat with corrosion Converter. Be sure to spend the tinning of the surface patch and the repaired surface with the back side of the body. Powerful solder soldering iron made patch from the inner side of the hole. As a flux use the acid rust Converter. Circuit soldering do solid. After carrying out soldering work thoroughly flush the repaired surface. Measure the patch on the outside of the body. If it protrudes above the surface of the bubble, drown her, applying light, frequent strokes of the hammer with wooden striker or through a wooden pad. Upon receipt of the dent, level it with a filler so that the thickness of the layer of filling was not more than 3 mm. Prior to filling, treat the surfaces with sandpaper large abrasive. Identify the areas for putting the Mat on the eyes. In any case it should exceed the size of the filling. Apply on this site adhesion risk using coarse sandpaper. Degrease the sanded surface with white spirit, simultaneously removing dust and dirt. Start to apply the primer immediately after degreasing. Two-component phosphate (acidic) soil pre-dissolve in a glass or plastic container and apply in the first place. If desired, use an acid primer from an aerosol can. Use it in a single layer, trying to avoid streaks. After 15-20 minutes apply a layer of two-component acrylic primer. Just run 2-3 layers with intermediate drying of 10 minutes. If desired, apply a primer from an aerosol can. Dry layers of soil at least 3 hours. To reduce drying time up to half an hour apply forced infrared heating. After all the surgeries swipe the putty, sanding and painting of the repair area.